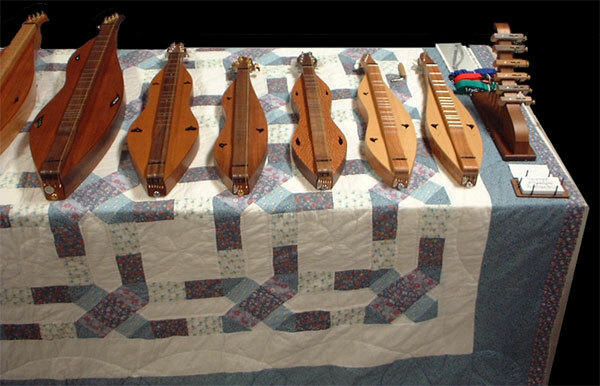 I have built and played about 1700 dulcimers since 1970 to date and can offer my customers the benefit of considerable experience as both a craftsman and a musician. I strive to build fine, attractive instruments at reasonable prices, in a variety of styles, and use only solid domestic and imported woods, selected for their tonal quality, beauty, and compatibility. I studied engineering and English Lit in college before I got the bug to build and play upon hearing a recording of the wonderful Richard and Mimi Farina. I apprenticed with Chet Hines - a retired civilian engineer by trade, and a builder and player of some renown in his later years. He grew up in southern Ohio and learned the craft from his grandfather. After a couple of years I took over production and built about 200 dulcimers for Chet before heading off on my own to study guitar building and develop my own mix of the traditional and modern. As a musician I have performed and taught throughout the country and am particularly known for my lively renditions of traditional Irish, Appalachian, and Euro dance tunes. I have guested on several recordings, including Jerry Rockwell's wonderful, "The Blackbird and the Beggarman." Most recently, I can be found playing the Irish slip jig "Drops of Brandy" with Jerry Rockwell and Leo Kretzner on "Dulcimer Celebrations" - a collection of live performances from Mountain Dulcimer Week at Western Carolina University. Features include a 1.5" wide fretboard, an accurate 27.75" 15-fret scale - including numbers 6 1/2 and 13 1/2 - a fully compensated bridge (usually only found on handmade guitars), a zero fret/nut for consistent action and ease of tuning, and precise Gotoh guitar tuners so your instrument plays in tune, and tunes easily. All instruments are hand-rubbed with a polyurethane gel that produces a hard finish with a natural, soft luster. Average dimensions are 35" in length, 8" in width, and 2 1/4" in depth (top to back, not including the fingerboard). 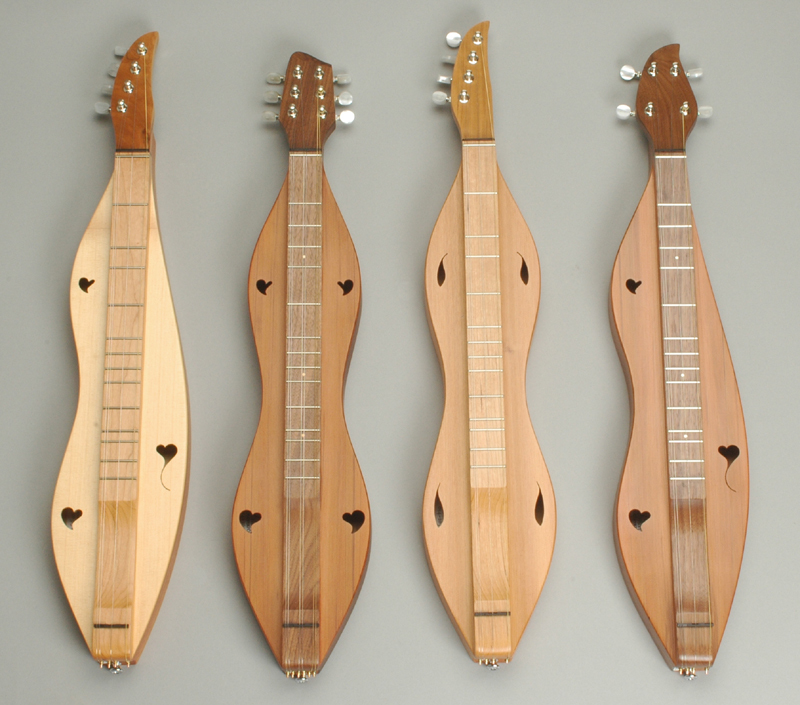 Unless otherwise specified, I set up my dulcimers for D-A-D' tuning. Options include 3, 4, or 6 strings (the latter in pairs), the 1/2, 1 1/2, and 8 1/2 frets for added flexibility, fully chromatic fretboards, pickups, and a variety of shorter or longer scales for small hands or particular needs. Full size 4 string models can be switched from double melody to equidistant stringing. Selecting a Model involves choosing , woods, soundholes, a body shape, a head style, tuners, and the number of strings. All else being equal, dulcimers with spruce or cedar tops are louder and fuller than comparable instruments with hardwood tops. I use spruce and western red cedar tops almost exclusively for this reason, as modern players prefer a more "guitar-like" sound. Western cedar tends to be mellower than spruce, although the latter will "play in" and warm up with age and use. My favorite combination for a warm, full sound and a beautiful dark look is a figured mahogany back, cedar top, and walnut sides, head, and fingerboard. There are many combinations of woods possible to give you the look and sound you want, however. I also use cherry, various maples, koa, lacewood, zebrawood, ebony, and various rosewoods - subject to current availability. I am a custom builder and can build just about anything you want and welcome a phone call to help you sort through the decision process. Email works well for short questions and general inquiries. Body Shapes include the aorell, hourglass, teardrop, and tearell. Hourglasses tend to fall on the bright side of the sound spectrum; elliptical on the bass side, though this will vary somewhat depending on the woods used and other variables. The aorell falls somewhere in between with a really nice balance to it. My favorite shape overall. The choice here is acoustic as well as aesthetic. Let me know what sort of sound you are looking for, and I'll do my best to accommodate you. Head Styles include the F and S heads with left hand tuners, for 3 and 4 string instruments, and the R, G, and A heads for 4, 6, and 8 string models. A lot of folks like the F and S heads for 3 and 4 string instruments, as the tuners fall more readily to hand. They can also be reversed for lefties. In the picture from left to right: F, R, G, A, and S.
Tuners used are Gotoh guitar machines which are available in chrome, gold, or black with matching position markers and strap buttons. Soundholes include hearts, trailing hearts, teardrops, crescents, shamrocks, seagulls, diamonds, trailing diamonds, and various original designs. Tip: When holding any dulcimer, always do so by the head and tail (like a baby) to avoid possible damage to the top. The soundhole area is particularly vulnerable. Baritones are larger dulcimers with 29 1/2" scales, typically tuned AEA' or GDG' below a standard dulcimer, with a correspondingly bigger, deeper sound - really majestic on slow tunes, and ballsy like an Irish octave mandolin on flat-picked reels and jigs. A true baritone is not just a standard dulcimer with heavy strings - you really need the longer string length, bigger body, and altered bracing and bridge to optimize the sound. 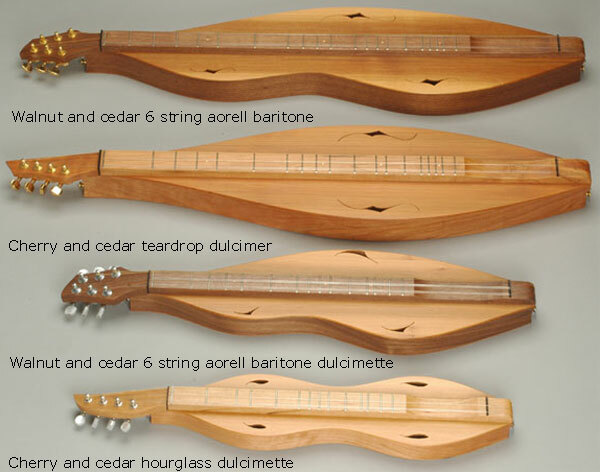 They come in 3, 4, 6, and 8 string varieties, with average dimensions about 2" longer than a standard dulcimer. With a 1 1/2 fret they also have a larger variety of chords for backup work than a typical DAD' instrument. An interesting equidistant 4 or 8 string option is ADAD and variations tuning (from low to high) that gives you more range, mirroring an octave mandolin - a baritone and standard combined in one instrument, with the ability to remove one outside course or the other, if you wish to play only 3 at a time. I can also build DAD' instruments with this scale length for a fuller sound and more sustain. Dulcimettes are small dulcimers that I designed back in 1975 as instruments suitable for backpacking, ensembles, carseat playing and children. They have a delightful mandolin-like sound that really carries and are owned and played by a number of top players. They are about 24" long, 5" wide, and 1 1/2" deep, with a 1 1/4" wide fretboard. They have 3, 4, or 6 strings, 12 frets, Gotoh guitar machines, and are built with the same woods and care as my full size instruments - they aren't toys, in other words. They are tuned to D-A-D' an octave above a standard dulcimer. 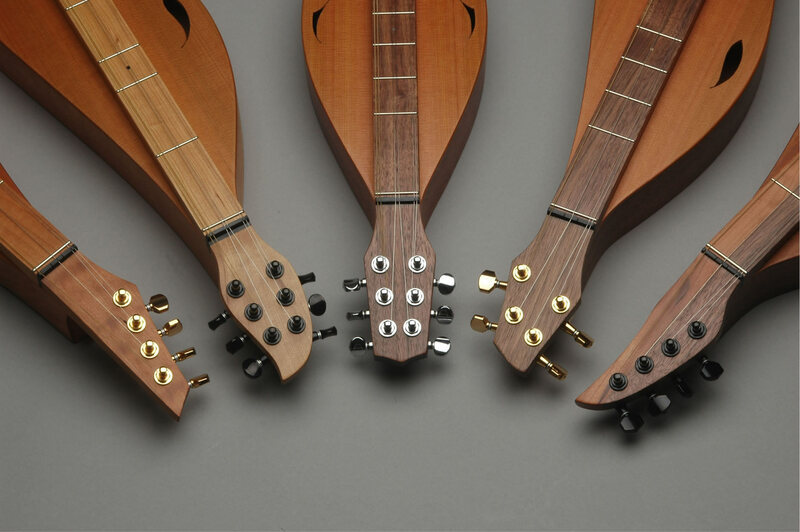 Six String Dulcimettes have a great full sound - sort of a cross between a mandolin and a dulcimer - and are especially nice for fiddle tunes, whether strummed or flatpicked. They really cut and will hold their own in almost any session. R, G or A head. Elegance in miniature. Baritone Dulcimettes are tuned an octave above a full size baritone in A or G with a 21" string length. They average 27" long, 7" wide, 1 3/4" deep, with a 1 1/4" 13 fret fingerboard. Six string models in G or A have a great mandola-like sound with more sustain, and are wonderful for fiddle tunes in these two popular keys. I play one of these more than anything else these days. Ron Ewing Dulcimer Capos: First on the market in 1975, and still the best. They just plain work! Capoing a dulcimer is a quick and easy way to change keys and modes without retuning, as well as having several advantages over the traditional modal tunings. Much easier than retuning every time you want to change keys or modes. You can't play everything in D, after all! They have a maple body with a walnut or cherry overlay for extra strength, hard rubber padding and clamp block, and a decorative brass dot and thumbscrew. Specify wood and width of fingerboard with order. A standard capo's adjustable range is 1 1/4 to 1 5/8", with custom versions also available for unusually wide or narrow fingerboards. Instructions for use, including a tuning/mode chart, are supplied with the capo. Designer Capos: Same as above but with a pearl snowflake inlay on an ebony or one of various exotic overlays. A touch of elegance for your dulcimer. Straps secure your dulcimer no matter what the seating, and inspire confidence whether executing delicate fingerstyle maneuvers or strumming jigs with wild abandon. 1" nylon, made by Sue Carpenter in a variety of colors; they are adjustable and feature a quick release buckle for fast exits. Highly recommended for dulcimettes, and about the only ones that fit. Hammer Dulcimers: 12/11's and 15/14's. Birch plywood back; redwood, cedar, or spruce floating top; hardwood rails, trim, and bridges (walnut, cherry, exotic, etc. ), delrin bridge caps for ease of tuning and reduced sustain, laminated pin blocks. Soundholes include hearts, birds, ovals, shamrocks, etc. All instruments include hammers, tuning wrench, a lifetime guarantee, and the sort of workmanship one would expect with 30 plus years of experience. My instruments are light, warm, and beautiful, with moderate sustain. Orders are accepted for a 50% deposit with the balance due upon completion, plus shipping and handling. For quicker service send the full amount. Delivery can usually be made in 3 - 6 weeks. Be sure to include a full description, number of strings and arrangement, tuning (if other than D-A-D') and any other particular requirements that you may have. I also try to keep a good selection on hand for those wishing to stop by and handpick an instrument. Simply call first, or catch me at one of the many festivals I do each year (see schedule). Thanks for visiting! Cheers, Ron.